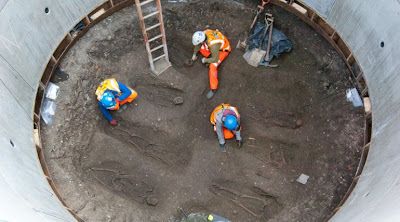 Recent development on London's Crossrail project at Charterhouse Square has unexpectedly unearthed bodies from the Black Death that date back to the Middle Ages. While a significant plague burial ground was previously known to be somewhere outside the City of London its exact location remained unknown until now. So far thirteen bodies have been found in the 5.5m-wide shaft. FIND works in partnership with Crossrail's archaeology and heritage consultant Museum of London Archaeology (MOLA) to produce HeritageRisk reports for vital early heritage site assessment. These provide site assessment of likely built heritage and archaeological issues for development sites. They are suitable for development feasibility studies, negotiations, due diligence, budget forecasts, acquisition decisions and project planning.